It appears that although Gates wants to carry on with what he calls ‘God’s work,’ people living in the third world are beginning to make their feelings abundantly clear. 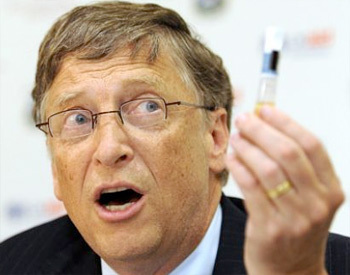 It appears that they don’t want his vaccines or his charity, as more shootings were reported in Nigeria. DO YOU KNOW WHAT’S IN THAT NEEDLE? They are right to be suspicious because it would not be the first time that vaccines were given with the intention of sterilizing women in the third world. In 1995, many third world countries were given a tetanus vaccine containing a birth control drug by the World Health Organization. An organization known as The Comite became suspicious of the protocols surrounding the vaccines and obtained several vials for testing. It was discovered that some of the vials contained human chorionic gonadotrophin (hCG), a naturally occurring hormone essential for maintaining a pregnancy. VacTruth has since been informed by Chadian contacts that the people of Chad are boycotting all vaccinations, while the parents of the vaccine damaged children stoned the school’s headmaster who had forced pupils to take the MenAfriVac Meningitis A vaccine. The parents have since announced that they have no choice but to take government and its international organizations to court. This is probably because whether Gates believes he is doing ‘God’s work’ or not, dumping severely vaccine damaged children in a remote village in Africa without a doctor on site is almost certainly not God’s work and this is exactly what Gates has allowed to happen to the children adversely affected by the MenAfriVac Meningitis A vaccine. “Last night the Chadian minister of health evacuated all children paralyzed from MenAfriVac meningitis A vaccine, including very ill children, to Faya. I have just spoken to one person, who told me that seven girls and a boy are seriously ill with convulsions. Over the past three months, members of the community of Gouro have reached out to VacTruth with desperate pleas for assistance as they helplessly watch their children suffer. We received a copy of one of the children’s medical records from their parent, which was written in French and translated on our behalf by Desiree Rover, an activist and avid campaigner from the Netherlands. According to the record of treatment, the child was admitted to the hospital for an “undesirable post-vaccinal manifestation” and “intoxication by meningitis A vaccine.” Over the course of the hospital stay, the child suffered from headaches, shaking, vomiting, intense abdominal pain, and “contractions,” which likely refers to seizures. Sadly, this child was prescribed Largactil, a psychiatric drug used to treat schizophrenia, probably due to the fact that members of the government have insisted that the paralyzed children’s afflictions were all in their heads. There is no mention in the clinical records of any prescription or treatment for pain relief or seizures. This medical record, as well as the others sent to VacTruth by parents, demonstrates that these children need continued medical care. Yet, the ill children have been returned to an isolated, poorly equipped village far from sufficient available help! As if the poorest regions of Africa has not had enough problems, GlaxoSmithKline has decided that they would get in on the act. Ethan A. Huff from Natural News reported on Feburary 19, 2013, that GlaxoSmithKline has teamed up with the company Biological E Ltd. and together they have decided that is a great idea to give the children of Africa a six-in-one vaccine. This is a single-dose vaccine for polio, diphtheria, tetanus, whooping cough (pertussis), hepatitis B, and Haemophilus influenzae type B. According to Natural News, a study published in the Indian Journal of Medical Ethics (IJME) found that cases of polio-related paralysis have skyrocketed as a result of widespread polio vaccine campaigns throughout India, which means the populations of India are not benefiting from existing polio vaccines as the vaccine industry claims they are. So the two companies decided to put their heads together and come up with a new vaccine to boost their own economy. In other words if at first you do not succeed, try, try, try again! Dr. Carley is right, as there is no better way of covering up adverse events than dumping sick children in the middle of nowhere and leaving them to die, is there? The saying ‘out of sight, out of mind’ springs to mind.